Last Friday I attended the Carl Solway Gallery opening featuring works by John Torreano, Hadley Holiday and Dyann Landry. Of all the works I viewed that night, the most inspiring were from Holiday’s, One With the Sun series. These paintings consisted of psychedelic and pastel shades in mandala-like patterns. My favorites included “Sky Vault” and “Blissed-Out.” I also enjoyed Landry’s Mandalas in the series Blue Decline; installations made from plastic water bottles and light projected as shadows onto the wall. After seeing the show, I realized that the mandala theme has been appearing in my life a lot recently; it feels like a sign that I need to explore them. 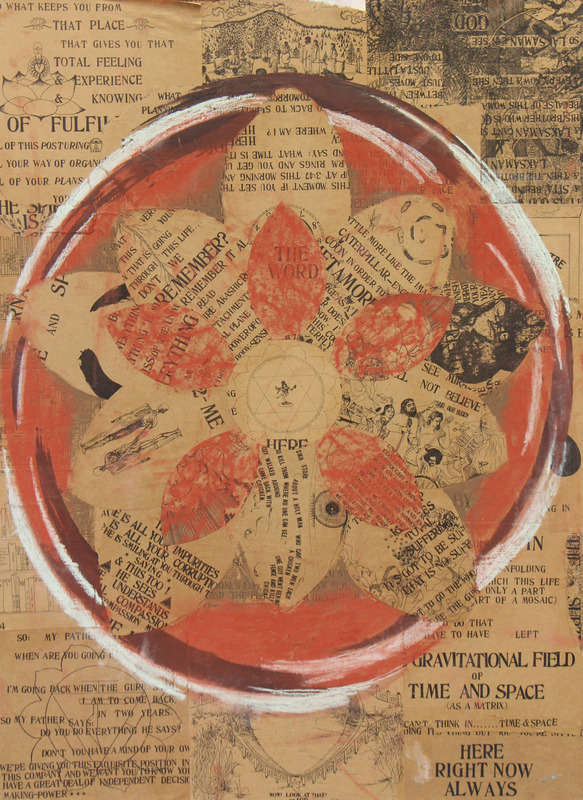 At the end of last year, I tapped into the mandala theme a little bit by creating a collage painting using the pages of the book, “Be Here Now” by Ram Dass. I chose this book in particular because it centers around Buddhist concepts that I am interested in. By layering the pages into the shape of a lotus flower, I was able to reveal certain words from the pages. Since that painting, I have been experimenting with other mediums and ideas surrounding Buddhism/food/abstraction. At this point I feel like I need to unify these ideas, and that mandalas might be the way to do so do.